The largest glacier in Greenland is even more vulnerable to sustained ice losses than previously thought, scientists have reported. Jakobshavn glacier, responsible for feeding flotillas of icebergs into the Ilulissat icefjord — and possibly for unleashing the iceberg that sank the Titanic — is an enormous outlet for the larger Greenland ice sheet, which itself contains enough ice to raise seas by more than 20 feet. Of that ice, more than 6 percent flows toward the ocean through Jakobshavn, which has raced inland since the 1990s, pouring ever more of its mass into the seas — a change that scientists believe has been caused by warming ocean temperatures. If all of the ice that flows through this region were to melt, it would raise global sea levels by nearly 2 feet. Just from 2000 to 2011, the ice loss through Jakobshavn alone caused the global sea level to rise by a millimeter. The U.S. East Coast in particular is already a “hot spot” for sea level rise, with rates in many areas exceeding the current global average of a little over 3 millimeters per year. But until now, researchers have not been sure how far Jakobshavn’s ice extends below sea level — or how much deeper it gets further inland. That’s crucial because Jakobshavn is undergoing a dangerous “marine ice sheet instability,” in which ocean-front glaciers that grow deeper further inland are prone to unstoppable retreat down what scientists call a “retrograde” slope. That’s where the new science comes in: Researchers who flew over Jakobshavn in a helicopter toting a gravimeter, used to detect the gravitational pull of the ice and deduce its mass, say they’ve found the glacier extends even deeper below sea level than previously realized, a configuration that sets the stage for further retreat. “The way the bed looks, sort of makes it more prone to continuous retreat for decades to come,” said Eric Rignot, a researcher with NASA’s Jet Propulsion Laboratory and the University of California-Irvine, one of the authors of the new study. Rignot conducted the research with colleagues from his own institution, New York University, the University of Kansas, and Sander Geophysics, which makes the gravimeter used in the study. The study was led by Lu An of the University of California-Irvine, and published in Geophysical Research Letters. The study found that Jakobshavn is close to .7 miles thick where it currently touches the ocean (with only a little over a football field of ice rising above the water and the rest submerged). Is it easy to say percentage above ice vs percentage submerged? However, only about five to ten miles inland towards the center of Greenland, the glacier grows considerably thicker and plunges deeper below sea level, eventually becoming over a mile thick, with nearly a mile of that mass extending below the sea surface. Moreover, the glacier is deep over a vast area. Along most of that distance, the ice will get steadily deeper and thicker, favoring faster retreat. 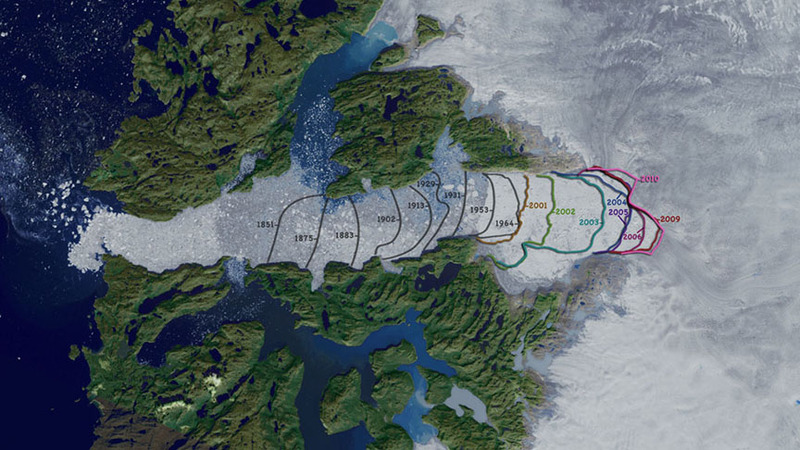 The glacier front is currently moving backwards at about a third of a mile per year, and will plunge into these deeper regions over the course of coming decades. The greater depth of Jakobshavn matters for at least two reasons. As it retreats, Jakobshavn will present a thicker ice front to the warm ocean, leading to even greater ice flow and loss. Meanwhile, the depth itself favors increased ice loss because at the extreme pressures involved, the freezing point of ice itself actually changes, making it more susceptible to melting by relatively warm seawater in the deepest part of the fjord. Granted, there are still some key limits on the speed of retreat – in part because the glacier remains hemmed in by the walls of a fjord that will exert continual friction upon its ice. 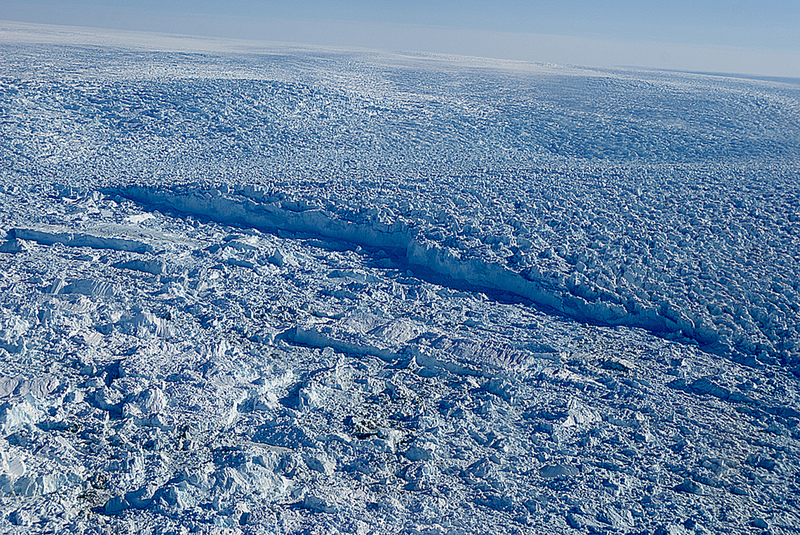 “The greater depth of the trough indicated by the new data will favor faster retreat, but it is such a narrow trough that some stabilization from the sides is likely to continue, so that there is still no worry of the whole ice sheet suddenly falling in the ocean,” said Richard Alley, a glaciologist at Penn State University who was not involved in the study. Alley said this still makes Jakobshavn less of a worry than Thwaites glacier in West Antarctica, which is far wider and less constrained. The deep passageway below Jakobshavn also underscores that, like another enormous Greenland glacier (the far northern Petermann glacier), this outlet connects with a vast and submerged system of canyons that deeply undercut Greenland and travel to its center beneath the ice sheet. “It’s a direct conduit to the heart of Greenland,” said Rignot. A few simple calculations help underscore why a further retreat – and accompanying thickening – of Jakobshavn glacier could be such a problem. Greenland is the world’s largest contributor to sea level rise – according to NASA, it is contributing 281 billion tons of ice to the ocean every year, nearly enough to cause 1 millimeter of sea level rise annually (it takes 360 billion tons to do that). That’s from all of the various Greenland glaciers and from general melting of the ice sheet that then runs off into the ocean – but Jakobshavn is the single biggest ice loser. Its estimated contribution of a millimeter of sea level rise over 11 years equates to a loss of about 32 billion tons of ice per year – but the new study says the glacier’s loss could increase by 50 percent as it reaches its deepest point. So, bump that up to around 50 billion tons per year. That would put Jakobshavn on par with the biggest ice losers in Antarctica – the enormous Pine Island and Thwaites glaciers – and would help push Greenland to the point where it’s contributing over a millimeter per year to rising seas all on its own, further increasing the rate of global sea level rise (which is also driven by Antarctica, smaller glaciers worldwide, and oceans that expand as they warm). And that, in turn, will make it much harder to adapt to rising seas.